That movie – Deep Field: The Impossible Magnitude of Our Universe – combines Whitacre’s orchestral work Deep Field with deep space visualizations captured by Hubble. The piece centers on the first “Deep Field” images taken when the telescope concentrated on a seemingly empty patch of sky during a ten-day period. The images captured include 3000 galaxies ranging from several million to 12 billion light-years from Earth. In each of those galaxies it’s estimated there are billions to trillions of stars. The film premiered in November 2018 at the Kennedy Space Center in Florida, and Whitacre invited a camera crew from J.W. Pepper to film the event and interview the project leaders. 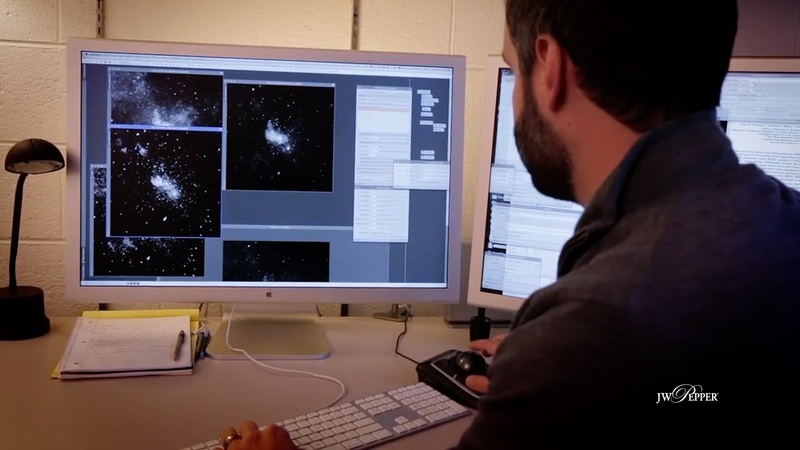 The video above and Pepper’s first blog on Deep Field in January give a behind-the-scenes look at this incredible work. One highlight of those interviews was a firsthand look at how the love of science and music often go hand in hand. Aside from Whitacre, many members of the team have backgrounds in both science and the arts. Astronomer and visualization specialist Joe DePasquale used both his science and music backgrounds during the Deep Field project. Here he is utilizing scientific data from the Hubble Space Telescope to help convert black and white images into fully colorized animations. Greg Bacon, the project lead at Space Telescope Science Institute, played trumpet, baritone horn, and tuba in school. Astronomer and visualization specialist Joe DePasquale also played in band in school and now gigs as a guitarist. Astrophysicist Dr. Frank Summers is a dancer and choreographer who takes after his mother, an off-Broadway dancer. He says that his experiences in the arts have greatly benefited him when putting together scientific animations of Hubble images. Such combinations of science and the arts are certainly not unusual; they were core components of education back in ancient China and Greece. In more modern times there have been numerous musicians with science backgrounds and vice versa, including individuals as diverse as Brian May from Queen, who is an astrophysicist, and Albert Einstein, who played the piano and violin. The Deep Field team has embraced the concepts of STEAM, including the addition of online educational activities on the deepfieldfilm.com website. Scientists like Dr. Summers who have seen the benefits of incorporating the arts in school generally support turning STEM – science, technology, engineering and math – to STEAM by adding the arts. The Deep Field project is a prime example of this. Viewers grasp, not just scientifically, the magnitude of the universe and how small Earth is within it – the film also captures the raw emotion behind such revelations. That emotion, though, is certainly not the only benefit to STEAM. Whitacre points out how crucial an integrated curriculum is for intellectual development in general. Whitacre demonstrates this by using rational math to create original compositions. Like some other composers, he likes using the Fibonacci sequence as a musical foundation. The sequence is a series of numbers that is made by adding the two numbers before it. Therefore, the numbers begin 0, 1, 1, 2, 3, 5, 8, 13, 21, etc. Artists have used the ratio of these numbers to create both visual and musical masterpieces, as detailed in this article from Classical FM. Whitacre also explains on his website how he uses math to make music. This process of using different disciplines to explore a topic can also be utilized in schools. Scientists say one of the best ways to reach students is to integrate science and the arts in the classroom. Here are some STEAM resources that may help. In the article How Music Education Benefits the Brain, Dr. Nina Kraus covers the many ways that learning music aids students. In addition to her studies, there have been numerous research projects focused specifically on how music helps students with science and math. In March, Johns Hopkins University released a study called Singing for Science that shows how the arts can help students retain information. Researchers studied 350 students in fifth grade in various schools in Baltimore, Maryland. They analyzed content retention over time, including a test that was given 10 weeks after the science material was presented. The researchers found that students’ long-term retention improved dramatically when they sang songs about science. These findings echo those of other studies that have looked at this phenomenon. A journal article by the University of Washington that was published by the National Association of Biology Teachers further explored how music helps with memory and recall. This article focused on how music can help students with attention. In addition, the rhythm and rhyme in music also serve as organizational mnemonic devices for the brain. Likewise, repetitions in music and the multiple sensory modalities involved in music learning, including auditory, visual and kinesthetic, also help the educational process. 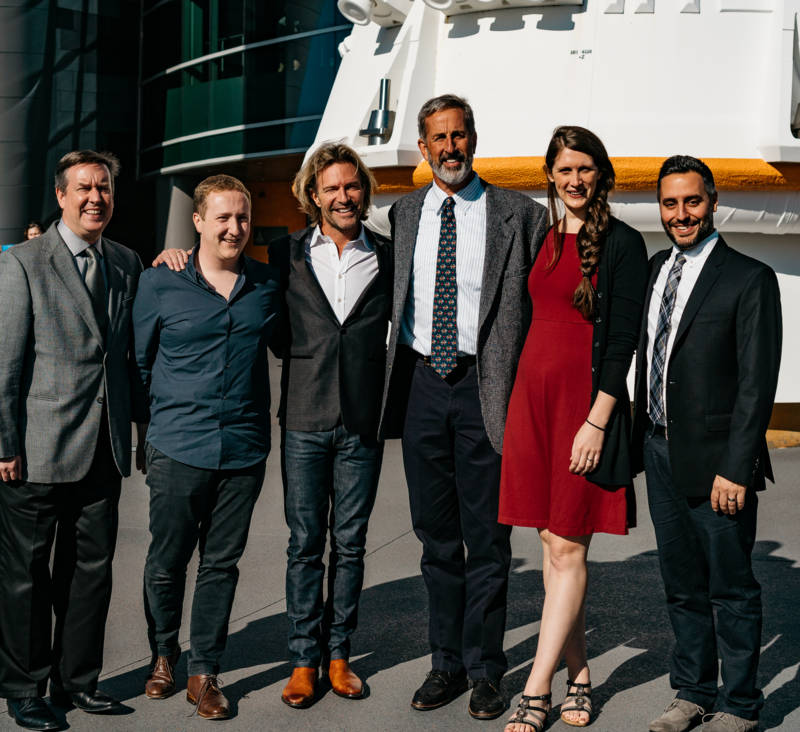 Eric Whitacre (third from left) is joined by project leaders Dr. Frank Summers, Richard Slaney, Greg Bacon, Dani Player and Joe DePasquale for the Deep Field movie premiere at the Kennedy Space Center in November 2018. The team had to combine their talents in the arts and science to create their breathtaking film. On a broader scope, music also helps students collaborate in ways that are very helpful to anyone considering a career in the science world. Just as students unite in band or chorus, Dr. Summers says scientists need to excel as team members. He says the staff working on Hubble also coordinate with other astrophysicists around the world who are utilizing telescopes and observatories that analyze different wavelengths than Hubble, such as x-ray and infrared. This is necessary for scientists to learn as much as possible about the universe. That need for collaboration has further promoted efforts for more projects combining the expertise of artists and scientists. Design and technology executive John Maeda, who was the former president of the Rhode Island School of Design, has actively supported efforts for a STEAM approach to education. Back in 2013, he wrote a blog article in Scientific American on how artists and scientists are alike and why they should work together. This is evident in the Deep Field film that utilized some of the best minds in science and the arts. You can view the film here to see how combining these disciplines can create something truly beautiful. To learn about the virtual choir featured in Deep Field, see our blog article from February.